Welcome back to Movie March! All month long, we’ll be looking at and reviewing animated films from both the east and the west. We did a classic eastern before from Japan’s Disney, so… why not a classic western from actual Disney? The Little Mermaid marked the start of the “Disney Renaissance”, an era where they would produce a lot of their best known films, including Aladdin, Lion King and Mulan. It was also, alongside Fantasia, one of the Disney films that had an impact on my early childhood. I still remember saving newspaper coupons to get a cassette tape of some of the songs. That was over 20 years ago now though, so it’s time to see how The Little Mermaid holds up in modern times. The plot is very much the archetypical Disney romance… though I guess this was before it was archetypical… Anyway, Ariel (I spelt her name many ways in my notes, that was not one of them) is a mermaid and princess of the sea, and the more free-spirited of all King Triton’s daughters, being endlessly intrigued by human society despite an age-old conflict (never explained). One day she happens upon a boat which is carrying, amongst others, Prince Eric, and falls in love at first sight. So when the boat gets struck by lightning, she saves his life and carries him to shore, with him only getting a fleeting glimpse and the memory of her song, leading him to fall for her as well. Which is fine, I believe love at first sight is perfectly possible, but it is hard to buy into the relationship of these two at the best of times. Eric does next to nothing until the final moments except look pretty, and Ariel doesn’t fare much better, having a few quirks such as that free-spritiedness, but that’s about it. Rounding out the rest of the good guy cast is the usual assortment of animal sidekicks, and… well, they’re okay. They all do enough to justify their roles in the film, but none of them are particularly memorable. 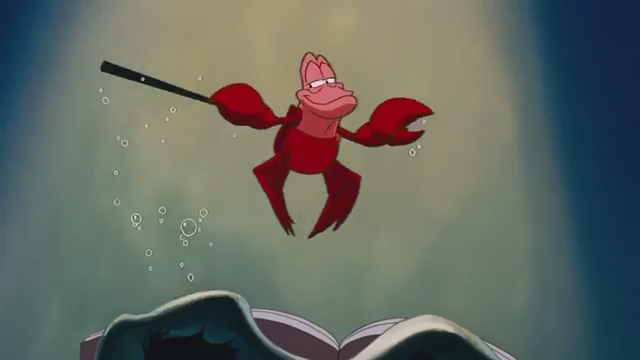 Flounder is a scaredy-cat fish who is a good friend to Ariel, Sebastian a conductor crab who is meant to supervise Ariel but just ends up getting dragged along with it all, and Scuttle a seagull who is the mercast’s guide to humanity… except he knows nothing so just makes it up as he goes along. His charisma is endearing though, and his presence does create some of the funnier moments in the film. As for our villain, we have Ursula, the Sea Witch. Ostracised from the underwater court ages past, she became constantly embittered and loves to make people suffer as a result, aiming to stab at the heart of King Triton. Having her merhalf be that of an octopus really helps her stand out and look more sinister than others, and she also seems to share some design traits with Hades, the villain from Hercules which would come out a few years later. Perhaps the biggest surprise of the film were her minions, Flotsam and Jetsam, who besides having awesome fitting names and a cool glowing eye each, also buck a lot of animated film trends by being competent. In fact that may be underselling it. They’re downright devious, capable of being just as manipulative as their master. 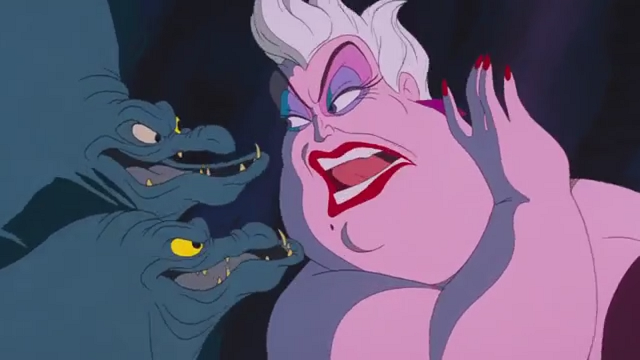 What’s more, Ursula clearly respects and trusts them, and is clearly upset when the two get destroyed. It’s refreshing for a company that would go on to make most of their underlings goofballs. Going back to the rest of the plot and how the two end up together, Ariel makes a deal with the devil as it were, sacrificing her voice for three days of humanity, where she has to kiss Eric to seal her new life. No, she never writes anything down, that’d be the easy solution. The two spend time together and he falls for her all over again, and despite some attempts at meddling and a really interesting finalé where Ursula looks sure to have won… true love prevails. I’m skimming over a lot, obviously, but it’s not like there’s a huge amount of drama outside of “just kiss already”. Ariel’s wonder for the human world comes across well, and Ursula plays her role to perfection, but a lot of it just feels bland. Again, I get that that’s a modern perspective, but it’d be nice if a bit more actually happened. In terms of the other big Disney movie hallmark, the songs, there’s some good’uns and some duds, though nothing as memorable as Let It Go or Make A Man Out Of You. 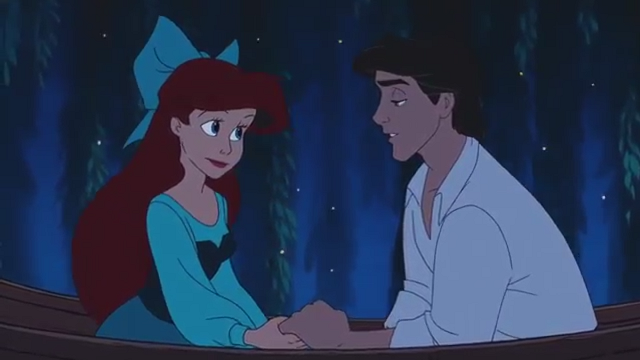 Under The Sea is pretty fun, as is Part Of Your World, but I really didn’t need several minutes of Sebastian running away from a French chef or hoards of animals singing to try and get the two leads to kiss in something that feels almost like sexual harassment. 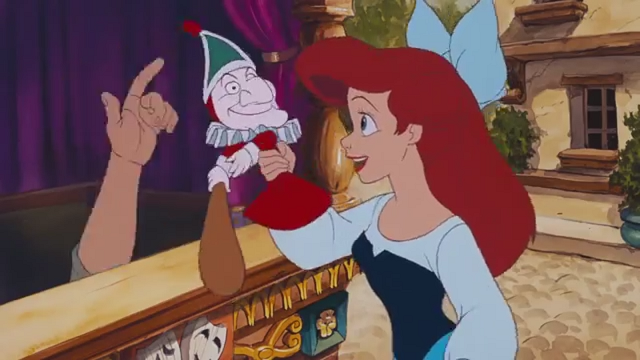 It’s not even the first instance, with Ariel being very touchy-feely earlier in the film. And how does nobody notice the talking animals? 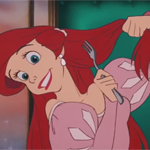 Like, I’m not trying to be picky here, there are some cool narrative callbacks such as using a fork to comb your hair and I feel the villains are well written, but it never feels like the leads really have to work to achieve anything. Ariel even goes back to being human come the end, destroying any chance of a “humans and merfolk working together” plot hook that could’ve been interesting. What I can’t complain about is the visuals. Underwater scenes manage to be a riot of colour, fish and other wildlife look full of life and expression, and Ariel’s goshdang hair is a dream. That last one probably sounds weird, but this might be some of the best animated hair I’ve ever seen. While works like Moana and Free have improved on the aquatic experience, this never feels particularly outdated or a step backwards. It’s a weird one, then. I can see how at the time this became so popular, offering a fresh and exciting experience. But almost 30 years later, a lot of what The Little Mermaid does has been done far better elsewhere, often by Disney themselves. That doesn’t necessarily make the film bad… though having the two lovers be so bland in so many respects pushes it… but it does mean I wouldn’t go out of my way to watch it again, like I would other Disney movies. I guess it’s best left UNDAH THA SEA hahaha I’ll show myself out.